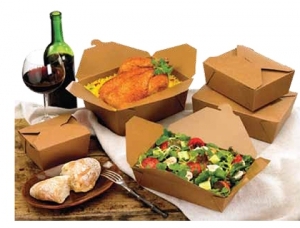 Fold-Pak is a manufacturer of quality take-out packaging for the food service and grocery industries. Environmentally conscious businesses favor Fold-Pak products because they are made from a sustainable resource. Fold-Pak is not made of plastic, foam, aluminum. These are natural resource that cannot be replenished. Fold-Pak developed Bio-Plus® Earth and Fold-Pak® Earth Food containers. This is made from 100% recycled paper using at least 35% post-consumer recycled paper. Green Restaurant Association endorses the Fold-Pak Earth product lines. Their logo is printed on the bottom of all containers. This allows your customers to feel good about your business. Instead of the materials found in traditional containers such as, foam, plastic, and aluminum, Bio-Plus Earth and Fold-Pak Earth uses paper materials. Fold-Pak containers hold hot, cold, wet, or dry foods. They have a variety of features such as chlorine-free, leak resistant, and stackable. You can serve full course entrees or side dishes. Keep your food fresh, hot or cold, in these great containers. The containers have a coated interior that retains heat and vents steam. Fold-Pak is also microwaveable. The design of these containers eliminates container inventory, because it is one piece and requires no assembly. Easy for customers and easy for you. Fold-Pak® containers can be custom printed in up to 3 colors, using water based FDA prescribed inks that are safe for the environment. Contact your BioMass Packaging salesperson for more details.